Good basic recipe. I made the primal one with just leeks and potatoes and salt. When done I did blitz it in the blender as I have little ones who would have struggled with the leeks. Made a lovely simple soup. We had it with French baguette, some cured meats and other nibbles on the side. Very good. Made the onions, also did bacon. Cooking time is very much a judgment call, as it is so short and thus so dependent on how thick your liver slices are. I hit it right, but wouldn't want to bet on doing it again. I love the formula from this book, it makes it easy to be creative about your quiche. I made these in frozen phyllo tartlets. How many minutes should you cook green beans? Is it better to steam them or to boil them? What are the right proportions for a vinaigrette? How do you skim off fat? What is the perfect way to roast a chicken? Julia Child gave us extensive answers to all these questions--and so many more--in the masterly books she published over the course of her career. But which one do you turn to for which solutions? Over the years Julia also developed some new approaches to old problems, using time-saving equipment and more readily available products. 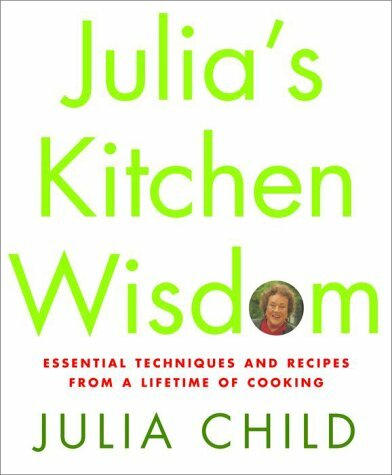 All the answers are close to hand in this indispensable little volume: the delicious, comforting, essential compendium of Julia's kitchen wisdom--a book you can't do without. Information is arranged according to subject matter, with ample cross-referencing. How are you going to cook that small rib steak you brought home? You'll be guided to the quick sauté as the best and fastest way. And once you've mastered this recipe, you can apply the technique to chops, chicken or fish, following Julia's careful guidelines. And here is equally essential information about soups, vegetables, and eggs, and for baking breads and tarts. It's all waiting for you in this delicious, priceless, comforting compendium of Julia's kitchen wisdom.